Golden Lobster Claw is a plant 2-4 m tall, with a well-developed pseudostem. Leaves are 3-5 per shoot, green, longest blade 75-150 cm long, 18-33 cm broad. Inflorescences are erect, up to 45 cm. 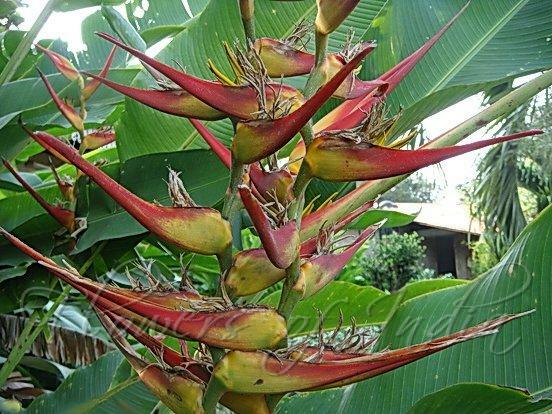 Showy bracts are spirally arranged, 8-13 per inflorescence, middle bract with outer surface orange and red and hairless, 14-19.5 cm, 5--7 cm wide at base. Flowers are 10-15 per cincinnus, hidden inside the base of bracts. They are green, yellow, or orange with dark green sepal margins, sometimes sparsely puberulent along fused sepal margins, 3.5-4.6 cm, 7-8 mm wide at gibbous base, nearly straight. Fruits are blue in color. 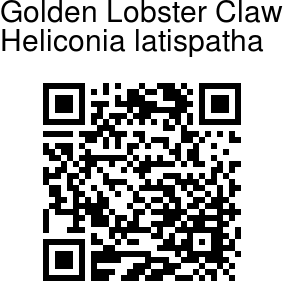 Golden Lobster Claw is native to C. America and S. America, widely cultivated world over.